Eddie Cochran had a hit with this song in the late 1950’s. Eddie was born in Albert Lea, MN, about 12 miles north of my hometown of Emmons, MN. Tonight is Borderfest in Emmons, and for my readers attending tonight, have fun and I’ll try to make it next year. I didn’t find out about Borderfest until 6:00 pm tonight. Anyway, Eddie was wrong. Spending time with my sisters-in-law today was a cure for the blues. Thank you, Suzy and Julie, for sharing your scarce free time with me today. I wish you knew how much it brightened my day, and I hope I brightened your each of days a bit, too. It was the first Saturday I did not go into the office since Memorial Day. I’m sure I’ll pay for it on Monday. The three of us went to visit Carver Country Flowers and Gifts this morning. If you’re in the area, stop in and kindly support Annette and Al in the Mission: Small Business grant initiative! Their shop is also on Facebook (Julie, you were asking about this earlier). Afterwards, we got to visit my father-in-law for an hour. I set out the Japanese beetle traps and I am getting some of the vile creatures contained. Instead of using the rather expensive disposable bags, I modified mine to use the top portion of the bag, a sprinkler system hose coupler, and some one-liter Powerade bottles. I attached the top half of the bag to the top half of the coupler with a pair of zip ties, and the bottom half of the coupler went through a hole I drilled in the Powerade bottle cap. The bottle contains a few drops of Apple Fresh Dawn dish soap in 8 oz. of water. The soap weakens the water’s surface tension and the beetles sink rather than float. There is no escape once the critters slide through the bag into the bottle. I dump the water every other day. 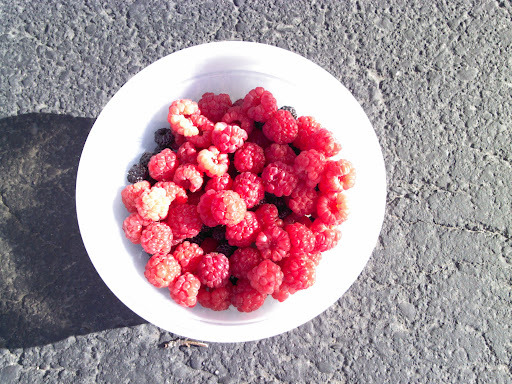 I managed to pick a little over a pint of berries tonight despite the mosquito onslaught. The dry spell is slowing down the berry production. There are a couple of chances for rain this week, so I’m going to let nature do the watering for me. I hope everyone is having good weather. Enjoy some quality time with your spouse, significant other, or kids tonight. Today’s raspberry and blackberry harvest. I’m trying to figure out where the past nine days have gone. I know work has consumed a goodly portion of it. The one nice thing about gardening is seeing all the changes that occur on different timelines. I’m already picking blackberries and raspberries and my green beans are flowering. The Japanese beetles are dining on the roses, but their numbers are down considerably from this time last year. I didn’t get a chance to lay down Grub-X this year, but maybe the drought last summer thinned the herd. This is the only time of the year I tolerate crows. They love eating Japanese beetles and their larvae. I wish the squirrels and chipmunks would acquire the same taste. I picked up lures for my Japanese beetles traps and will get the traps set out tomorrow. I think there are about two pints of raspberries to pick. The false sunflowers, blanket flowers, bachelor’s buttons, and catmint around the mailbox are all in bloom now. On the south side of the garage, the various yarrows are in bloom, including a couple of colors I know we didn’t plant. All the clematis are blooming, but it looks like I lost a hardy hibiscus after eight years, and the Russian sage looks like it is on its last legs after almost thirteen years. There has been just enough rain lately to keep the tamarisk loaded with its tiny pink flowers, but not enough to sustain the mosquito population. I think that’s a pretty good balance. It’s been warm, but the humidity has not been as beastly oppressive as a couple of weeks ago. It appears we’re in for a stretch of upper 80’s to mid-90’s for the next week with only a couple of chances of rain. Of course that will be the day I decide to get the car washed. Tomorrow will be the first Saturday since Memorial Day weekend I have not had to go into the office. I’m hoping to have a couple more weekends like that before the next crunch kicks in. Try to brighten someone else’s day when you can! Thank you for your time, and have a wonderful evening. It’s 2012, not 2013. Sorry, Dana, you’re not 20 yet! Today saw a little rain this afternoon and evening. I saw a double rainbow tonight. The inner rainbow was nice and strong, the outer one was somewhat weak. The last double rainbow I saw was when Lucy and I were returning from her mother’s funeral last August. Lucy liked rainbows. The rainy weather here is hatching two unfortunate crops: mosquitoes and Japanese beetles. I’ll have to find time this weekend to set out the Japanese beetle traps. I know I’ll be putting in some time Saturday at work. So maybe there was no pot of gold at the end of tonight’s rainbow, but it did bring back some nice memories of Lucy and me looking out the window at rainbows. She would smile when seeing one. I hope you had a chance to smile tonight, too. 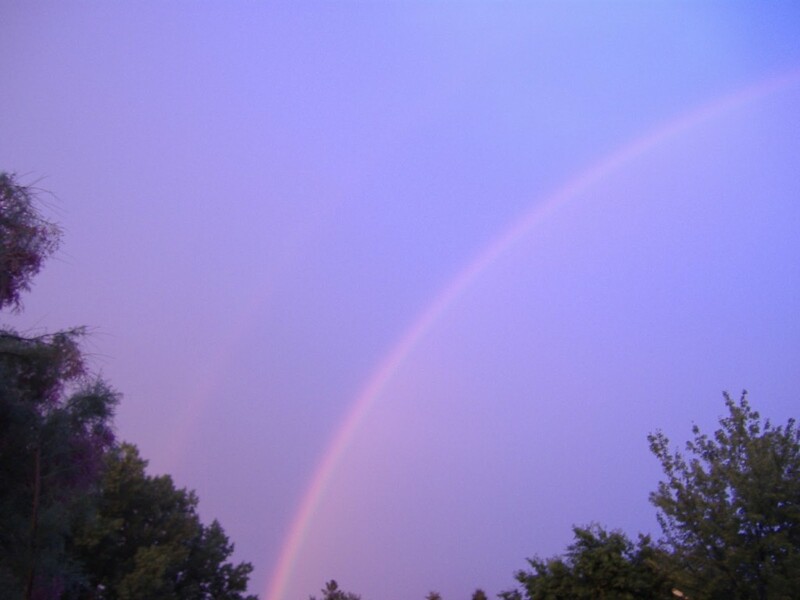 The double rainbow from tonight. 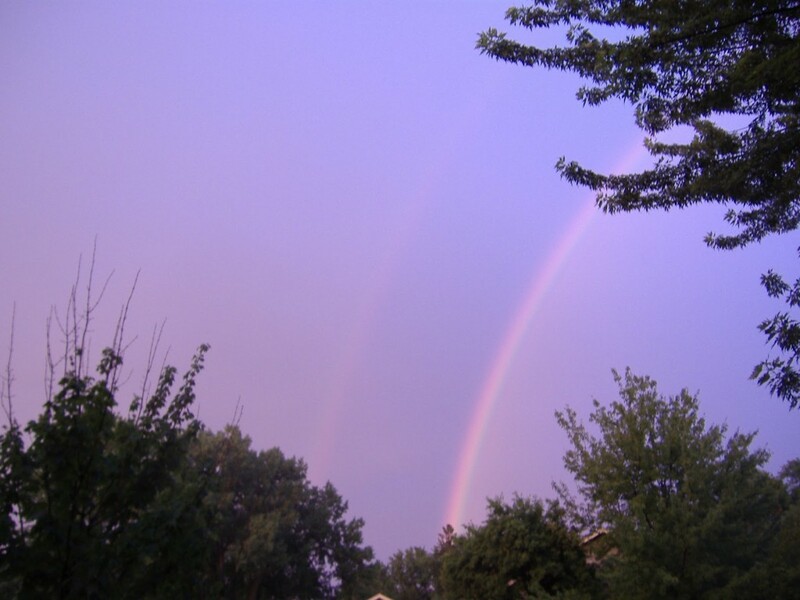 Another view of tonight’s double rainbow. I’ve been battling some sort of stomach bug for the past four days and I’m still putting in a bit of overtime at work. So to my father and father-in-law, your Father’s Day cards will be a day or two late. To the both of you, thank you for all your support and patience. It has made me a better person. I’m starting to figure out some of the concepts of the various technologies, but it’s been a slow process. It’s frustrating because I usually pick up programming languages and other technologies very quickly. I’m looking at the process as “short-term pain for long-term gain”. The questionable part is defining “short-term”. We’re out of the monsoon season, but we are still getting enough rain so that I have not had to water anything but the pansy bowl in front and the Impatiens in back. The mini glads have shot out of the ground, the dahlias and cannas are over a foot tall, and the mystery Delphinium I moved earlier in the season is a deep purple. Lucy only bought true blue Delphiniums so this one is courtesy of a bird. All the shrub roses are in full bloom and the climbing rose has bountiful blooms. Lucy’s lilies are looking better than ever. I’ll be picking about a pint of blackberries in a couple of weeks and five or six quarts of raspberries in early July. Lucy loved this time of year when everything was blooming and green. I’m sure she is happy her gardens are doing so well. For those of you who can, give your father (or father figure) a big hug today. Trust me, they have earned it! Today marks two months since Lucy’s passing. It was another long day at work, and the indications are this is not going to get better for the next month or longer. Suzy was over tonight to pick up some magazines. It was nice seeing a friendly face today. Happy birthday to Ardelle tomorrow. Give your loved ones a hug tonight and make the hug meaningful.